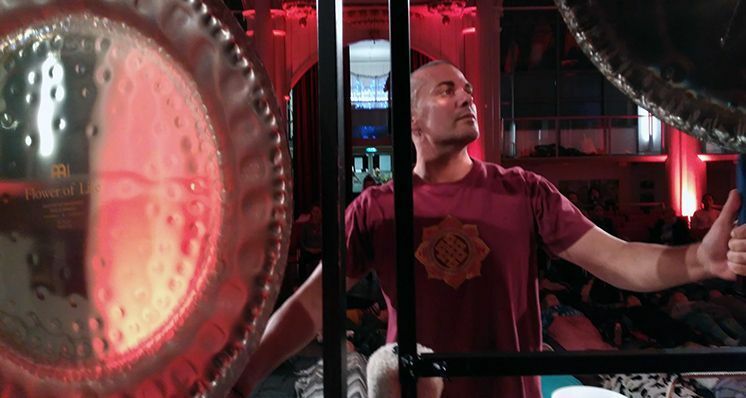 A gong bath is not a concert. A gong bath consists of a powerful ancestral Tibetan practice where the participants lie down while receiving the vibrations of different gongs. Mundo Armonía performs these harmonization concerts with sounds from various gongs. It is a powerful therapy or ancestral vibrational practice with several huge gongs and different resonances. The gong immerses the listener in a world of peace and inner emptiness where inner silence and calm is found. Its harmonious and powerful sounds surround us and modify our energetic vibration. The most recent studies about this ancient instrument consider it a very useful element in the field of meditation, since its sound causes a modified state of the instant consciousness. After a gong bath you may feel like reborn. It’s a stimulating, exciting and always beneficial sensation for the human being in his healing and rebalancing process with himself and with the world. Thanks to its great resonance and depth of sound it creates a deep relaxation, freeing us from the torrent of thoughts that our mind discharges, and stimulating the glandular system towards a higher level of functioning. The gong impacts the body and its meridians. It releases blockages, reduces tension and stimulates circulation. The result is a reorganization and revitalization of emotional energy, and the feelings that are tied to the body structure. The release of emotions is a natural process of Meditation with the Gong. The gong changes thoughts that are blocked by cutting out thoughts that sustain and recreate negative feelings. There is only one thing that the human mind can command: The sound of the gong. It’s the first sound of the universe, the first sound of creation. Just click here to check our agenda and find out about upcoming events, workshops, courses, gong baths and more.